Friday (11/30) after cleaning I put together a new Christmas scene on top of the CD cabinet with all new decor I picked up from a few places this month. 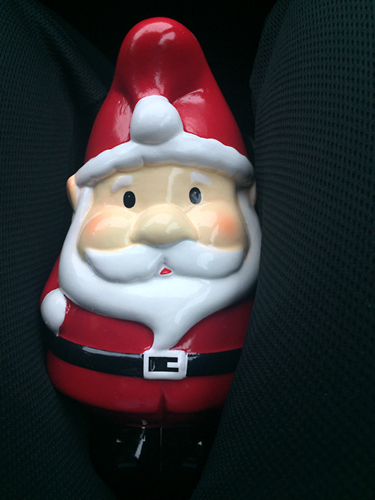 I also bought this cute Santa gnome from Target earlier in the month. I really don’t care for gnomes normally but every time I was looking around their Bullseye Playground I’d see him and think he was so cute, so I finally gave in and got him since he was only $5. Saturday (12/01) morning we headed over to Bath & Body Works to get a few candles since they were on sale for $8.95. I was pretty shocked to see how crazy crowded it was in there at 8 am. Despite the long line it only took about twenty minutes to buy my two candles (both Marshmallow Fireside because I really don’t like most of their scents). We then headed to Walmart and Target. While at Target we met with a guy who was buying our Xbox 360 drum set for $15 via Offer Up. We bought it for around $12 and paid $7 for the drumsticks (which I included in the sale) so not bad considering we were only out $4 for a few years of use. We never used it anymore because it was hard to master. I’m happy to have the space it frees up in the closet. I got a chance to play with the Nintendo Switch at Target and was really liking it. I tried Mario Kart but I could see myself liking the Bomberman game (at least the battle mode) but I’m not sure it’s worth spending $300 on the system and who knows what else on games. After shopping we had a quick breakfast before taking Wookie in for her annual exam and vaccinations. She got the three year rabies shot so while the total bill was higher than last year (just under $300, yikes! ), we won’t have to do that test again until 2021. Her exam also included the Bordatella vaccine which is annual, as well as parasite tests so those will have to be repeated next year. The vet did say her teeth didn’t look as bad as I thought so we probably won’t have to take her for a dental until next year which is nice. She was given pre-meds to prevent her from having a reaction to the vaccines which worked like a charm as she didn’t get sick at all. After her appointment we brought all the Christmas decor out of the garage and decorated the inside of the house while listing to Christmas music. 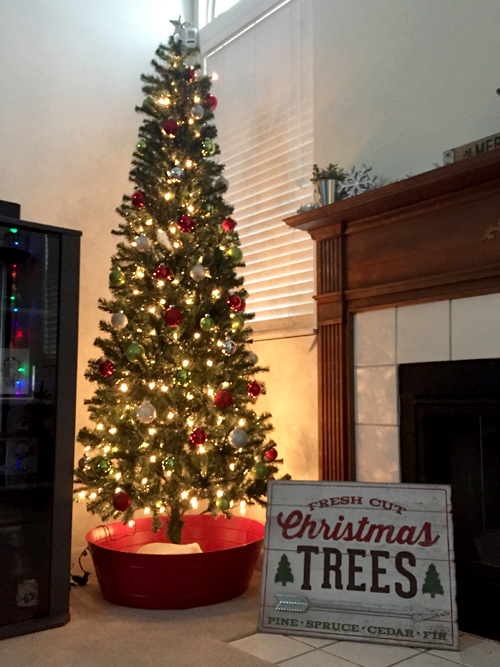 We are loving the new 7 ft slim tree we got on clearance for $15 next year. We also bought a red tree collar to replace the tree skirt Wookie ate last year. She won’t be able to chew on that! We took our time setting everything up so it spanned about three hours total. This is probably the earliest we’ve decorated for Christmas in a very long time. 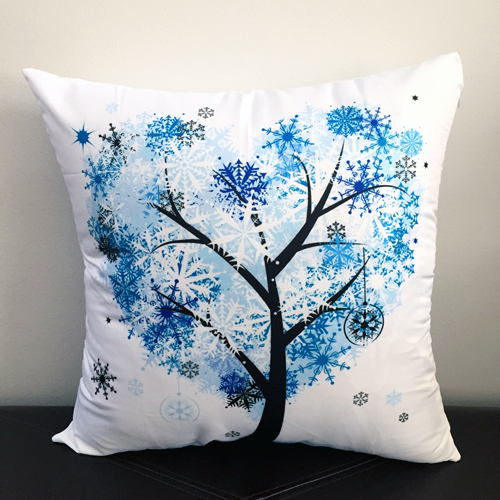 It definitely helps having a tree that doesn’t crowd the living room so it probably won’t bother us having the tree up for nearly a month long like it has in the past. Plus we don’t have to shift things around in the dining room like we have in the past. Sunday (12/02) we did a little shopping but decided to skip a trip to the Apple store like originally intended. We had made a deal earlier in the week that if Joe pulled the trigger on ordering a new laptop for $800, then I would upgrade my phone in lieu of us exchanging gifts, but now I’m not so sure I want to do that. He already ordered the laptop though so he’s been bamboozled haha (although not intentionally). As I’ve mentioned previously, I want to have a nice phone for our planned Disney trip in early 2020 and while the phone itself would be fine, I worry the battery won’t be great since at that point it would be around 14-15 months old. I could get a phone now and then trade it in for the newer model next year, but that seems rather wasteful so I’m really hesitating. I do want a new phone, particularly for the improved camera, but I don’t want to shoot myself in the foot regarding our trip. I keep going back and forth on this. I wish the iPhones weren’t so damn expensive these days. I thought my iPhone 6 was pricey at $400 and yet the 256GB iPhone XS, which is the model I’m interested in, is $1150!!! Ugh. As of this writing I am probably going to hold off until next year October. Let’s just hope my phone holds out until then. I haven’t updated to iOS 12 because I’ve heard it slows the phone down, plus I would lose an app I use daily. The problem is some of the apps I use sometimes require me to update them to keep using them and I worry at some point they won’t work with iOS 11. Hopefully that doesn’t happen until next year! After shopping and getting a few treats from Trader Joes, we stopped at PDQ for lunch and split the Grilled Hawaiian and Pimento Crunch sandwiches, both of which were so good. We especially liked the Pimento cheese. We made a quick stop to drop off some donations for our dog park group before heading home to relax the remainder of the afternoon. Today (12/03) Joe worked from home so he took a morning break so we could get some breakfast from McDonalds and go to Savers. I’ve been looking for a red sweater to wear on Christmas. Unfortunately it was a bust despite trying on a few promising sweaters. 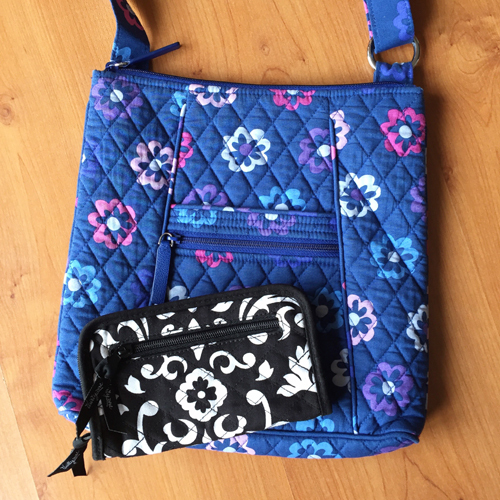 I did, however, grab two Vera Bradley items for a good price. The purse was $7.50 and the wallet was $4. Later in the evening we made a quick trip to Dunkin Donuts where I got some delicious Oreo hot chocolate before we went to Cosley Zoo to check out their lights because the Ozinga Merry Mixer was on site. We didn’t stay long though because it was seriously freezing cold out.